FORZA's premium training soccer ball for top level clubs. Highly durable and long-lasting, the dual-bonded ball is suitable for use on all surfaces. Available in two sizes. Designed specifically for use by professional clubs, this premium standard training soccer ball has been manufactured to the highest specifications to provide high levels of performance and consistency. Powered by revolutionary Hybrid-Fusion technology, the dual-bonded design of this training ball alongside its tough embossed outer-layer makes it perfect for consistent use on hard and soft surfaces. Whether it's crashing against the woodwork, rippling the back of the net or colliding with tough surfaces, the reinforced and interlaced bladder ensures that the training ball stays in shape. Designed to optimize practice sessions for professional soccer clubs, the FORZA Pro Training Fusion Ball combines durability and consistency to provide MLS performance. 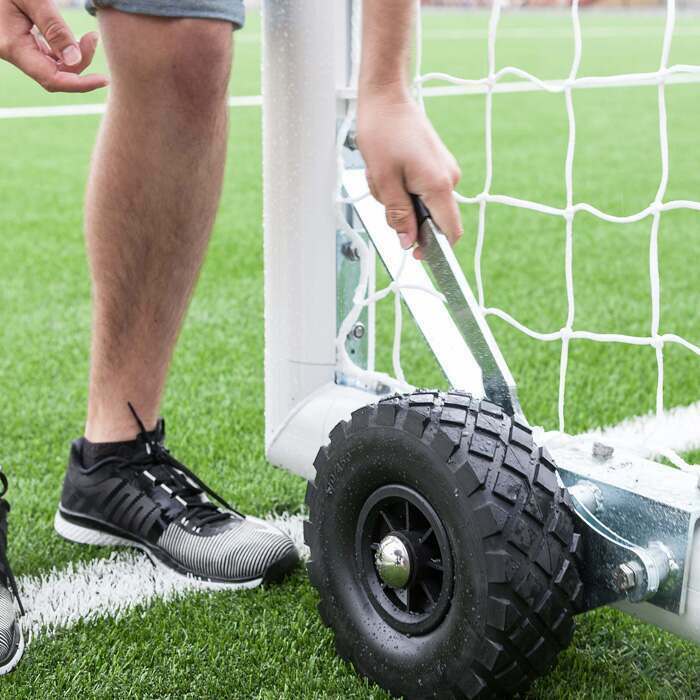 The top of the range ball is suitable for use on the increasingly prominent astroturf and 4G surfaces as well as traditional grass training pitches, harnessing the capability for season-long sessions in all weather conditions. Hard-wearing and reliable, this premium quality ball is an essential training aid for any club with their sights set on the top. Manufactured with a tough embossed outer layer, this training ball has the longevity to endure countless full-throttle training sessions. The strong design of the ball provides high levels of consistency which is crucial when engaging in regular training drills. Representing the best signing your club could possibly make, the FORZA Pro Training Fusion Ball is a highly durable and long-lasting soccer ball which is certain to take your training sessions to new heights. Inferior balls can succumb to wear and tear under the weight of intense use. Having been designed in conjunction with FIFA IMS specifications, this pro-quality training ball has the fortitude to handle whatever comes its way. Embodying ground-breaking Hybrid-Fusion technology, the innovative dual-bonded design boosts power and consistency, while its interlaced and reinforced bladder enhances shape and inflation retention. Give it your all during every training session safe in the knowledge that this ball can keep up with the pace. Its eye-catching and vividly colored design will freshen up your repertoire and look great nestled in the back of the net. Perfect for table-topping senior sides and youth teams alike, this professional soccer ball is available for selection in both size 4 and size 5. Don't miss a sitter - pick up this essential piece of training equipment for soccer clubs and reap the rewards when matchday comes around.